October | 2013 | LIT.GAZ. 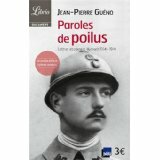 Whilst on my recent trip to the Somme battlefields, I bought a copy of Paroles de Poilus, edited by Jean-Pierre Guéno. It’s a collection of letters or extracts from letters, from French soldiers in the First World War, to their loved ones. There are occasional extracts from German soldiers’ letters too. Each letter is accompanied by brief biographical details; the whole comes from a national project to preserve this form of personal history, and the archives are lodged in the excellent Historial museum at Péronne. The soldiers are very aware, from the start, that they are unlikely to survive, and accepting of their fate, by and large. They are supported by their religious faith as well as their patriotism; they try to console their loved ones with an eye to posterity and future generations who will survive them. Like their British counterparts, they describe the horrors of what they encounter; if anything their experience seems even more chaotic, with poor supplies and food, and also the readiness of the military authorities to summarily execute soldiers who seem not to have done their duty. The French executed about twice as many soldiers as we did. One thing we should remember next year as we commemorate the centenary of this horrendous and disastrous conflict is the very different experience of other nations and peoples; it was a world war, after all. I found this book very irritating indeed, mainly from the lack of decent editing. Its subtitle claimed it to be a biography of cancer, and I was branching out from my usual fare for something different, that I hoped would be enlightening. It wasn’t. For starters, it was hard to see who the audience was meant to be: the general reader? but there were long sections full of scientific and genetic terminology and abbreviations that just made my brain hurt… and surely any medical person would have learned very little from it. Most of the time I felt you had to be a US citizen to have permission to read it, as almost all of its recountings of attempts at surgery, therapy and palliative care were from the USA, as if nowhere else existed, no other people got cancer, no-one from any other nation had done anything about it. Only very briefly and occasionally were the efforts of other nations acknowledged. To learn anything you had to wade through acres of chaff, with brief biographical sketches of various people which seemed to be tacked on in an effort to make the book more interesting. And I didn’t feel a lot wiser when I got to the end. OK, so what had I been expecting? I wanted a clear introduction to the disease, and the history of how our knowledge had developed over time and where it might look to be developing in the future, a fairly reasonable expectation of a popular science book, I think. I’d have liked some exploration of what I know to be the wide range of different types of cancer; this book relies heavily on breast cancer and leukaemia, excluding most of the rest. And because it tried to be a biography (why?) it rambled all over the place: you can’t write a biography of a disease. Editing, I have come to realise over many years of reading and numerous encounters with unsatisfactory books, is a highly skilled art, and also one that most publishers do not seem inclined to spend time and money on nowadays. So we end up with shapeless and overlong books, with acres of notes padding out the page-count and explaining high prices, and often riddled with factual, grammatic and spelling errors. (The origin of the word ‘metastasis’ is NOT Latin!) I can understand that an academic book, and perhaps the first hardback publication ought to have full source notes, but surely a paperback edition could just point the curious reader to an archive website where the notes could be accessed? So, all-in-all underimpressed, and relieved that I didn’t actually spend money on this book to read it. I was astonished to find writing about the First World War that was even more horrific than Remarque’s All Quiet on the Western Front, but Storm of Steel manages it. It’s the account of four years on various sectors of the Western Front by a German lieutenant who survives (clearly) though wounded and hospitalised seven times, and who was eventually awarded the Empire’s highest military decoration at the age of twenty-three. Jünger was a nationalist, and some feel his writings glorify war. I was interested, when I looked up what happened to him after, that he refused to support the Nazis or be used by them, that he experimented with LSD and other substances in the 1960s and survived to the age of 102 (among lots of other things). What stood out for me is that this book is clearly factual – a memoir – in a way that All Quiet isn’t. It was written in 1920, so has immediacy, though not the reflectiveness of the memoirs of British writers such as Graves, Blunden or Sassoon. He fights in Flanders and on the Somme, describing the British attack of 1 July 1916 from the other side. He takes part in the German offensive of spring 1918. His picture of occupied France and Belgium is at odds with other accounts I have come across. He pulls no punches in his descriptions of war and its effects on people and places. Comrades are mutilated and killed by the score, and he moves on, sometimes allowing that he is affected, but mostly focused on survival for himself and his comrades. You can see how his experience of war over time makes him a better soldier and survivor, even in the chaos of the First World War. You can also see how he gradually realises that Germany will be outfought. I say outfought, because we see the effects of the Allied blockade through the increasingly poor quality of the soldiers’ food, contrasted with the plenty discovered in captured British trenches and dugouts. Equally, the impression is that it’s superior firepower that tips the balance for the Allies: they just shell the daylights out of whatever they plan to attack; there is no limit to their resources, whereas it becomes increasingly clear that Germany is running out of materiél. The nature of the war also becomes clearer in terms of what each side was faced with. Germany’s great advantage was to have attacked in the first place, and to have had a couple of years to entrench themselves and build fortifications, and it’s clear from the book and from what I saw on my recent trip to the Somme, that these were formidable. Then they could just sit tight. (OK, I oversimplify a little…). The Allies had, therefore, to throw everything they could at the enemy. This led to the total wasteland that we are familiar with from photographs. However, when the war gradually developed into one of movement, however slight, it meant that things were more even: the descriptions of hand-to-hand fighting in the trenches in 1918 are some of the most gripping and horrific in the book. Only very occasionally do we get a glimpse of the degradation of humanity as a result of war that Remarque portrays so brilliantly in his novel. 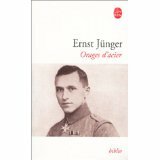 But I didn’t find myself agreeing with those who felt that Jünger’s book glorifies war. It’s a remorseless account of the effects of human stupidity on those who have no power to change and shape their world, but who want to survive. I’ve written about silence before (Diarmaid MacCulloch’s Silence: A Christian History) and recently re-read this book, which is also about silence with a Christian perspective, but also about the personal need of, and quest by the writer to find a suitably silent place to live out the rest of her life. We live in an incredibly noisy world: traffic noise, ambient music, machinery that beeps and squeaks whenever we use it. There is an awful lot of meaningless conversation and talk to fill up the gaps, and in some ways perhaps many people are afraid of silence. Maitland explores the issue from all angles: it’s an erudite read, and yet she is always in there herself, and thus enabling a reader to explore for themselves, too. In some ways she follows in the footsteps of Thoreau, except the house that she creates for herself (in an isolated part of Scotland) is not seen as a temporary, but a permanent home. There were times when I felt she was being rather self-indulgent, but her quest made sense and I was happy that she seemed to have achieved her goal. It is good when a writer can acknowledge and explore more than the material aspects of our existence, and this is an account of a spiritual quest, too. It is hard going in places, but a good book and thought-provoking, which is why I went back to it. I came across this French traveller and writer a couple of years ago, and I’m still trying to decide what to make of him. I can’t really class him as an explorer, because I don’t really think there are any of these nowadays, with travel generally being so straightforward compared with long ago (sweeping statement, I know, but this is my blog), so maybe ‘extreme traveller’ would fit the bill. He goes to faraway places, and spends a long time there, with a purpose, and endures considerable, though self-chosen, hardships, and then writes about them, very well. L’Axe du Loup hasn’t been translated into English. I had to read it, because Tesson was fascinated with the book The Long Walk by Slawomir Rawicz, which claims to be an account of an escape from a Siberian gulag by a group of Polish prisoners during the Second World War, and how they trekked to freedom south through Siberia, Mongolia, the Gobi Desert, and Nepal to India. I say claimed, because much recent research has thrown doubt on Rawicz’ story, and it seems more likely to have been a composite account of what many prisoners went through at the time, and certainly to have been possible, though not actually achieved by the man himself. See wikipedia for details. Tesson decided to try and make the journey himself, on foot, carrying everything with him. It’s a fascinating and gruelling journey; he’s well aware that he’s chosen to make the journey and can opt out at any moment, that he doesn’t have to beware of everyone he meets lest they send him back to the gulag, that he can stop and rest, and that he can carry food with him. He makes the journey, and demonstrates that it could have been done; his descriptions of the route and his encounters are very interesting. Sadly (and I know I’m beginning to sound like a broken record) the maps are poorly drawn. 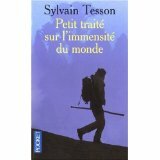 Tesson is clearly fascinated by Siberia: Dans les forets de Siberie has been translated into English and is well worth the time and effort. He decides to spend six months (February to July) in a small, isolated cabin on the shores of Lake Baikal, and this is his diary of his time there. In some ways it’s a retreat and journey of self-discovery – can he cope? He does visit people and is visited, too; he has ample supplies of food and can supplement them with fish, and he has an inexhaustible supply of vodka and cigars, as well as reading matter. The observations of the seasonal changes are well described, and the peace and tranquillity seem very welcoming, though clearly considerable inner resources are needed to cope with such isolation, but he does talk of returning. He is a person who clearly find our hectic society of noise and continuous consumption unbearable, and I have a lot of sympathy here; his reflections are worth reading. I wonder if other people have a problem deciding what to read next? I have a large pile of new books waiting to be read, and an equally large pile of books waiting to be re-read. Sometimes I really can’t decide while pile to head for. There are times when, after reading a book for the first time, I find myself feeling ‘why did I bother?’ or ‘what was the point of that?’, in the sense that I would have been better off working through the re-reads, rather than trying new stuff, on the grounds that there is very little that’s interesting being written now… Then I think that it’s my age, and that I’m turning into a dead colonel before I’m sixty. But… I do feel that I’m becoming much choosier about what I buy now: fewer books, usually in carefully chosen genres, very little current affairs, mainly travel and fiction. If a book stays on my wish list for a long time, then that’s a sign I probably will end up buying and reading it. It certainly saves quite a bit of money. The pleasures of re-reading: like meeting up with an old friend, looking at a favourite scene from a new angle, relaxing somewhere I know is comfortable. And the excitement of discovery of something new is the other side of the coin. I worry that there isn’t enough time in one life to read everything, and there isn’t, of course, which makes it OK for there to be some quite major gaps in what I have read, and some territories where I feel no inclination to tread. It is rarer that someone turns me on to a writer I’d never have considered myself; the last time this happened was when one of my former students introduced me to e e cummings. Sometimes I feel oppressed by being surrounded by so many books (there are between two and three thousand dotted around the house, in almost every room) and feel I ought to get rid of a lot of them: after all, how many of them, realistically, am I ever going to get back to? On the other hand, books have been my life in so many ways, so why should I expel them?